I’ve decide to eat cheesecake for lunch today. 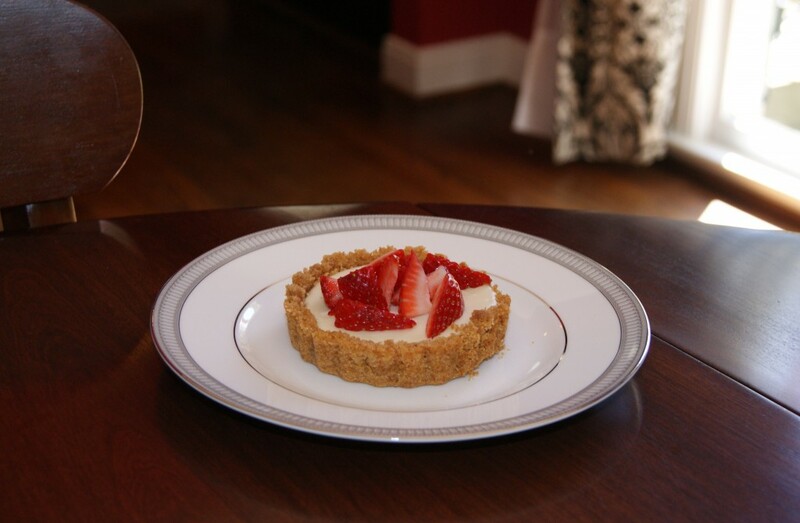 I made mini cheesecakes last week for my china and jeans dinner party, but didn’t manage to photograph them that night. So I’ve made more and photographed them today. Then I realized I didn’t eat them at the dinner party either, as I was entirely too full from the meal. In order to write up an accurate description and review of my recipe, I am forced to eat cheesecake for lunch. Rough life, eh? These cheesecakes are made from the tartlet pans I purchased last spring with the super nifty removable bottoms for perfect mini crusts. I absolutely love anything in a graham cracker crust, key lime pie filling is my personal filling of choice. But since I’m branching out, I decided to fill them with cheesecake. What’s your favorite filling? I need some more ideas as these individual desserts make such great presentations. Happy Tuesday, I’ve declared it eat dessert for lunch day, feel free to join me. This recipe provides a light – almost fluffy cheesecake with a hint of sour flavor. Preheat oven to 300. In a food processor pulse to grind up the graham crackers. Pour crumbles into bowl and combine with sugar and melted butter. Press about 2 tbsp of mixture into each tartlet, then press with fingers to evenly cover bottom and sides. Add cracker mixture as necessary to ensure that all sides of tartlet are covered. Place tartlet pans in oven to crisp cracker mixture for 3 minutes. In a stand mixer fitted with paddle attachment, beat cream cheese until smooth and you see no lumps. This seems to take an unbelievably long time, but be patient, it will appear smooth eventually. Add sugar and beat until combined, add eggs one at a time, then use spatula to scrape the sides of bowl. Add vanilla and sour cream, beat until combined. Pour mixture into tartlet pans. Bake in oven 14-16 minutes checking at 14 minutes by jiggling pan. If the entire filling jiggles cook the additional 2 minutes, when only the center jiggles remove from the oven and cool on counter. Cover with plastic wrap and refrigerate for at least 3 hours. Remove from tartlet pan by pushing up from the bottom. Use a butter knife to remove the disc bottom and plate.